In the first instalment of case studies from Wirral Council, we focused on how Local Insight was saving the Wirral Intelligence Service time and resources by allowing them to respond to data requests in a much more efficient manner. However, Local Insight isn’t confined to just the Wirral Intelligence Service. Staff from across the organisation and beyond have been using Local Insight to support evidence-based decision making. Local Insight covers unlimited users across your organisation and strategic partnership. It has been designed to be accessible by all; so that you don’t need to be a statistician to gain useful insights. And with the public facing versions of the tool – anybody can access the data, without needing any login details. When looking for a data and reporting tool, the ease of use and flexibility were of utmost importance to the team – because they wanted to open access to the wider team and council. With more than 70 users trained in using the system, Local Insight has become a useful way to share and communicate data across teams. In a fast-paced environment with overflowing inboxes – reading reports can quickly end up at a bottom of a ‘to-do’ pile. Before using Local Insight, the team at Wirral lacked a way to be able to share the data and information they were producing in an accessible way, that people would pay attention to. Alongside all of the open data within the system, the team at Wirral have added in their own data too; by uploading the locations of key services and adding their own datasets to the map. This provides a centralised place in which to store datasets that are provided by disparate teams for reuse and to avoid duplicating work. The Licensing Team has also shared some of their data, on location of local assets – which has cross-cutting implications for the Wirral Intelligence Service. Using the data provided by the Licensing Team, some of the Wirral Intelligence Service ran a study on a couple of areas. The idea was that there are certain types of premises that are deemed ‘unhealthy assets’; for example bookmakers, pubs and payday loan shops. The team ran a study on where these were and came up with 5 niche areas that span a couple of streets, where there is a high concentration of these types of premises. 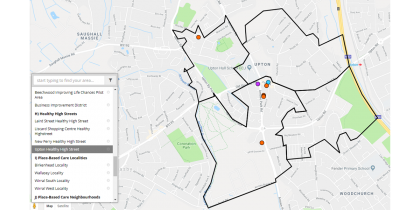 Local Insight was then used as a very quick and simple way of visualising these areas on a map, overlaid with the assets data, which could be used as accompanying visuals in reports and publications. Furthermore, once the Healthy High Streets had been set up in Local Insight, the team could generate an area profile report in minutes, to dig into the underlying data about those areas. We will publish the final case study with Wirral in the coming weeks – and it is one for anybody that is involved with place-based commissioning in their local areas. In the meantime, to see Local Insight for yourself; sign up for a free trial.